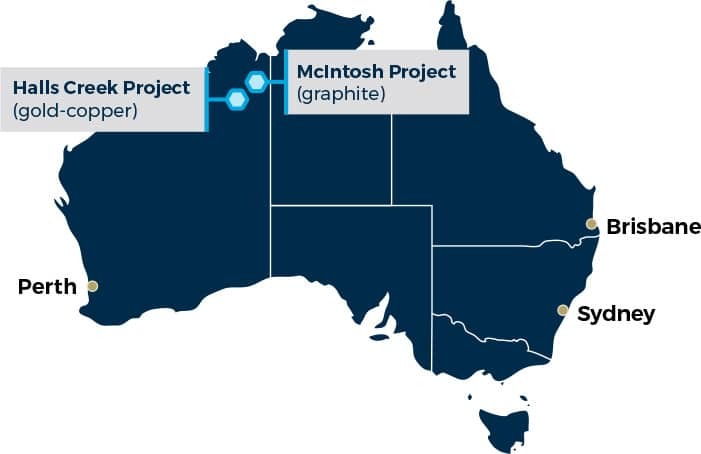 Our flagship McIntosh Project is a large-scale, high quality flake graphite deposit located in the Kimberley region of Western Australia. Resources for the project currently sit at 21.3 million tonnes grading 4.5 per cent total graphite carbon (TGC) for 964,000 contained tonnes (25 May, 2017). There is a significant Exploration Target comprising 110 to 220 million tonnes grading between 2.5 and 5.0% TGC which the Company will drill test to build up the project life. Hexagon has deliberately focused its technical resources on verifying the technical attributes of the McIntosh graphite flake as a genuine driver of value rather than build up the “mining metrics”. Graphite is an industrial mineral where the focus needs to be on product specifications and marketing. Partnered with ASX-listed Mineral Resources Limited (MRL), MRL will fund all Feasibility Study work, capital development and ramp-up costs to earn a 51 per cent interest in the project (subject to a positive feasibility study). A Definitive Feasibility Study kicked off in mid-2018 and seeks to increase the Mineral Resource and to further optimise the process flowsheet to produce several flake graphite concentrate products defined by flake size. Commercial production is planned to commence in 2021. Metallurgical studies show McIntosh graphite is high purity, high value with low purification costs. The concentrate material can be purified to levels between 99.99(4N) and 99.999(5N) per cent (five nines graphite the “nuclear purity world”). As Hexagon sought to diversify its end use applications it found that the Mineral Resource is dominated by graphite flakes classed as Large, Jumbo and Super Jumbo size. McIntosh graphite meets many premium end use requirements and has a range of technical attributes. Its rare and highly ordered crystalline structures make it suitable to displace synthetic graphite and it is easy and low cost to produce purify and micronise with excellent electrochemical properties. Hexagon is developing a vertically integrated graphite business; the upstream or Stage 1 development is focussed on its McIntosh Project as a primary source of flake concentrates. The downstream or Stage 2 is based on early purification of the graphite concentrates followed by additional processing, specific to the end-user requirements. Strategy includes multi open pit mining and simple flotation to produce around 100,000tpa of high-grade (96-98% TGC) graphite concentrate, likely across 3 flake sizes. Mineral Resources (via the JV) is contributing technical expertise from “the pit to the wharf” with a strong Western Australian operational presence. Commercialisation of a thermal purification circuit & downstream BAM/CEM & high purity ultrafine production lines. suitable for a wide range of customers but HXG’s focus is on electrodes in Electric Arc Furnaces (EAF) substituting for synthetic graphite on the basis of enhanced technical properties. destined for lithium ion Battery Anode Material (BAM) and CEM. Also suitable for a range of high-end industrial applications e.g. refractory (in furnace ladles and crucibles), mould release as well as emerging applications such as synthetic diamonds (for semi-conductors) and Obscuration (EM attenuation) technology. We aim to verify through an industry recognised “5M” qualification procedure that our graphite can meet the exacting specifications for high value applications through refining and secondary processing. Continued major improvements have been made to our conventional flow sheet for downstream processing. Our established downstream flow sheet starts with the purification of graphite concentrate to at least 99.95 wt.% total graphitic carbon (TGC). Approximately 31% converts to material suitable for carbon Conductivity Enhancement Materials (CEM), which is potentially a higher priced product and larger volume than BAM as it is utilised in alkaline batteries and other battery chemistries as well as rechargeable and primary lithium ion batteries.